Michigan State University celebrates 2010 Homecoming October 13 – 16, a time when we look forward to hosting MSU Graduates at our Lansing MI inn. Homecoming is a time for past graduates to return to campus and reconnect with old friends, whether you graduated five or fifty years ago. It’s also a time when graduates can reach out to undergrad students, sharing lessons from the work place and forging new friendships and contacts. 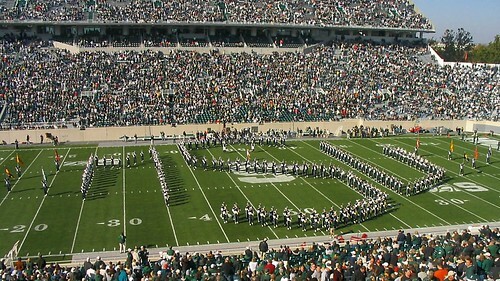 Homecoming at MSU creates a number of wonderful opportunities for both graduates and undergrads. The Alumni-Student Golf Outing on Thursday is sure to be fun for all who participate, plus it’s a perfect opportunity to learn about networking on the green. Also on Thursday, the Homecoming Spartan Mentor Program teams alumni with undergraduates seeking mentors. Thoughts of work will be put aside on Friday the 15th at 6pm thanks to the Homecoming Parade. Various Tailgating events take place before MSU plays the University of Illinois Saturday at noon: the School of Nursing will meet at Corner of Shaw Lane and Red Cedar Road at 10am, while the College of Education will meet at Demonstration Field. You get the picture. Back at our Lansing hotel, we’ll be working hard to make our guests comfortable and content. Our pub and restaurant are perfect places to retreat from Homecoming crowds and enjoy drinks or a meal with old friends.